The South American nation refers to the islands as the Malvinas. 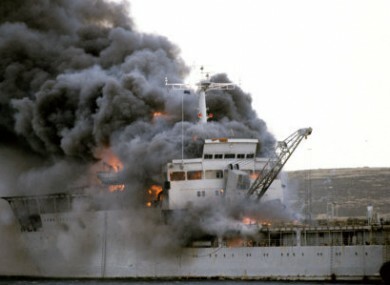 British vessel the HMS Sir Galahad ablaze after the Argentine air raid on at Bluff Cove in 1982. ARGENTINIAN PRESIDENT MAURICIO Macri says that his country’s claim to the Falkland Islands remains unchanged following Britain’s vote to leave the EU. “Brexit or not, our claim will never change,” Macri told reporters in Brussels after talks with European Union leaders. Britain’s vote to leave the EU in a referendum on 23 June has cast uncertainty on the country’s global position, including whether European states would continue to back Britain’s possession of the Falklands. Spain said after the vote that it was closer to asserting control over Gibraltar, the rocky outcrop on its southern tip, following the Brexit vote, prompting London to jump to the defence of its overseas territory. Speaking about the Falklands, Macri added: “That is something long-lasting and we hope one day that we can discuss (the issue with Britain). It doesn’t mean that we cannot meanwhile have other cooperation with Britain. It is something I have already discussed with Cameron, I hope that with the next English prime minister we can find the space to start this dialogue. It will take years but it is important to start. Britain and Argentina fought a short but bloody war over the Falklands in the South Atlantic in 1982 after Argentine troops invaded and then prime minister Margaret Thatcher sent a naval task force. The conflict claimed the lives of 649 Argentine soldiers, 255 British soldiers and three islanders. In 2013, almost 100% of the Falkland Islands’ residents voted in favour of remaining under British rule. Email “Argentina: Brexit or no Brexit, our claim to the Falkland Islands remains”. Feedback on “Argentina: Brexit or no Brexit, our claim to the Falkland Islands remains”.